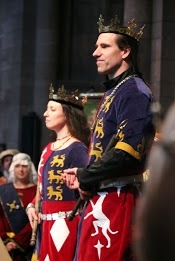 The body of King Kenric was brought by Queen Avelina to the stately cathedral in the Barony of Concordia of the Snows. His pallbearers carried his regal body in on a bier before the assembled court. The hall was silent at the sight of the great War king. Behind the bier walked the Queen, accompanied by her heralds, her guards, and her attendants as the sounds of Pange Melos Lacrimosum accompanied them from the musicians gallery. The Queen addressed the populace, her sad voice executing the will of the late king as she gave out the King’s cyphers. No vivats interrupted the King’s last business. His body was removed to be released for his final journey by fire. His eyes were covered by coins and a lyre was clasped to his chest. Her Majesty then concluded her own affairs so she could retire to lead a quiet life. The Concordia Brewers guild presented her with libations for which she thanked them and noted they would bring her some comfort in her grief. She gave out her cyphers to thank those who had assisted her as Queen, her voice strong and clear as it echoed through the cathedral. The Queen’s guard was called before her next. She informed that that her time on the throne had ended and dismissed them. Tears replaced her composure when she dismissed her Captain of the Guard, Baron Karl Meerstappa. Baroness eLeri Nefyn was awarded an augmentation of arms by the Queen. Countess Marguerite ingen Lachlainn described the augmentation as sounding “like a representation of Kenric and Avelina’s hearts” in token of their great affection for her. Baroness eLeri expressed gratitude and love for the King and Queen. Baroness eLeri also stepped down as Kingdom Mistress of Lists. Mistress Lylie of Penhill will take the position. When the Queen completed the last of her business, she called Prince Edward. Prince Edward entered, preceded by a Knight of the realm and a Pelican. He was followed by a Companion of the Order of the Golden Rapier carrying a Reliquary, and by squires carrying his shield and helm. Other Easterners followed to the martial music of Gaudete Heres Optatus and the exultant sound of drums. The serried ranks parted as Edward approached Avelina. Avelina somberly acknowledged Edward as the rightful successor to her late husband, and Edward graciously accepted her request that she be allowed to depart. Edward knelt before Avelina and was handed the reliquary, which contained a Relic of the First Tournament. 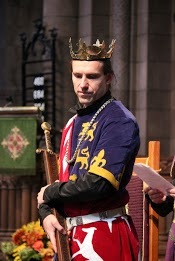 The Herald asked Edward to take an oath that he would serve as the chief defender of the realm, highest executor of its laws, protector of its ancient customs, and first defender of the ideals of honor and chivalry. Edward affirmed this. He also affirmed to keep the laws and customs, rights and franchises of the East; keep peace with the peers, the baronage and the people; and that he would use justice, discretion, mercy, and truth in his judgments. Avelina placed her crown in the hands of her kingdom seneschale, Hedewigis, and bestowed on Edward the crown of her late husband. She then retired to the plain chant, Firmetur Manus Tua, and Edward ascended the throne. An ampulla of water from the Bay of the Mistlands was brought to annoint the King so he would remember those who came before. The King’s Champion brought him a sword dedicated to the defense of the realm. A scepter was given to him to be a rod of virtue, and he was seen to smile when he lifted the scepter over his head. Lastly, he was presented with a ring for his hand that represented dignity. Hedewigis reminded Edward that he should not rule alone and asked if he would accede to a recent treaty, which he did. Princess Thyra was heralded into the cathedral by two trumpets and voices raised in the music of her Danish homeland, Dromte Mig En Drom. A Lady of the Rose and a Mistress of the Laurel preceded her, and she was followed by a Companion of the Sagittarius and other ladies. Thyra agreed to accede to the treaty between the House of Lochleven and the House of Darostur to stand together and lead the East upon condition of victory in the Crown Lists. The treaty as read also stated that Edward and Thyra would continue to rule Tir Mara until a prince and princess succeeded them; the lady Aethelthryth, daughter of the late king, had renounced all claim of succession; and that Avelina, the wife of the late King, had renounced the throne and would be granted lands due her service. Once the treaty was announced, Thyra knelt with the reliquary and took the same oath as her King, who then crowned her. The Queen’s ladies robed her in a heraldic garment that matched the King’s while a single flute played for her. They ascended their thrones together. The Queen was invested with the same artifacts as her King and swore oaths to match his. The King and Queen stood before their populace as the voices of the choir rang out in the cathedral performing the plain chant, Te Regem Laudamus. The King and Queen were confirmed by the Great Officers of the East and the heads of the baronies and crown provinces of the East. Edward and Thyra were then greeted by the populace in attendance with cheers. 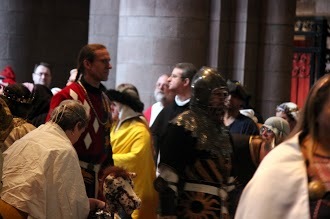 The King and Queen then exited to the chanting of the Rolls of the Kings and Queens of the East in Latin. The voice of the tenor lifted to the roof as the accompanying voices from the musician’s gallery supported him. The names were chanted in sets of five, and the court responded after each in Latin, “You ruled because we believed”. After the last names were chanted, Eduardus Secundus et Thyra , the court’s voices raised joyously with “You rule because we believe”. 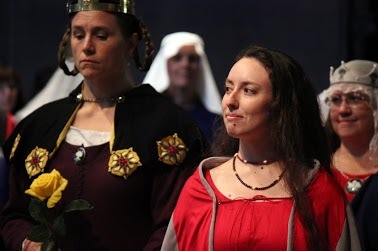 Thanks to Countess Marguerite ingen Lachlainn, Lady Aildreda de Tamworthe and Lord Lucien de Pontivi for their timely assistance with this story. All photographs by Baronne Cateline la broderesse, who has kindly provided links to the rest of her pictures here: Album 1 and Album 2. I don’t know if it’s photoshop or compression or magic, but I love the way the small pictures with the round church window look like medieval paintings. What a great description of a truly moving ceremony! 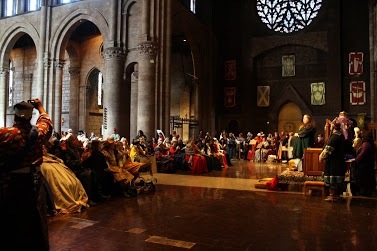 The Ordo (script of the ceremony) is at http://tinyurl.com/clzhrjn. I’ll be posting a report with an explanation of its development shortly. 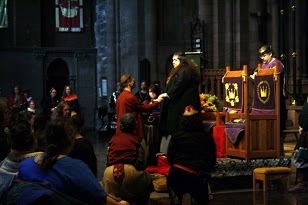 I wanted to present a ceremony worthy of this astonishing site, and I knew that the SCA’s restrictions on religion could be dealt with with proxies from our own internal mythology. I’m very deeply grateful to the Royalty, as well as the heralds and the several presenters and escorts, for going along with my mad schemes. I must also thank Mistress Aife, TRM’s performance coordinator, Mistress Linette, Mistress Deonna, Lord Lucien and Lady Aldreda, Lord Martyn, and all the musicians and singers — I can’t list them all here — for their immense contribution of time and effort. Trust me, you have no idea how much work they put in on this, coordinating the program among performers from all corners of the kingdom, with a result that was awe-inspiring. I second your praise of the musicians and singers. They truly made the day. You created an amazing ceremony, Steffan. I was glad to have even a little part in it. No photoshop. The site is the Cathedral of All Saints in Albany, NY. If you get a chance, attend an event at this site, it’s magical. A stunning venue and ceremony. How I wish that someone had video of the whole thing.